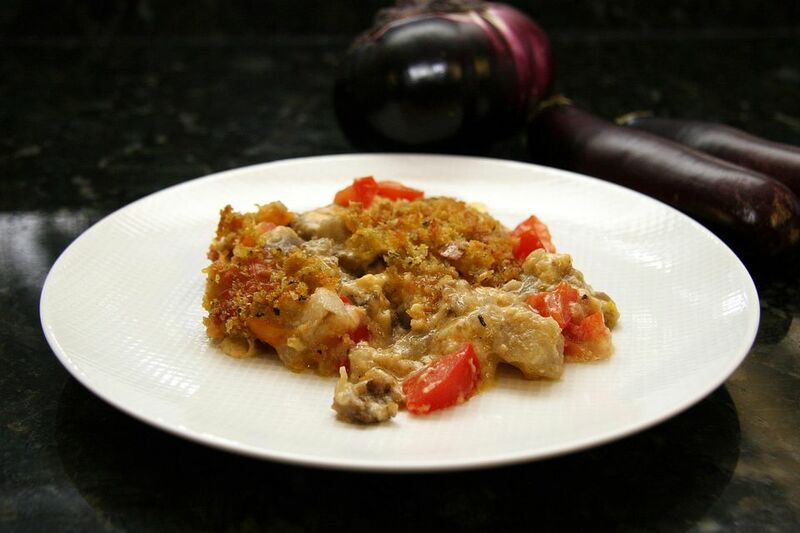 In this eggplant casserole, the eggplant is cooked and layered with tomatoes, cheese, and breadcrumbs. Basil and a seasoned white sauce bring it all together. This is a delicious way to use fresh eggplant, and it goes well with just about any meat, chicken, or seafood dish. Butter a two-quart baking dish. Put eggplant and onion in a saucepan; cover with water and add 1/2 teaspoon of salt. Bring to a boil; cover and continue boiling for 10 minutes, until eggplant is tender. Drain well and set aside. In the saucepan over medium-low heat, melt three tablespoons of the butter. Stir in flour until well blended. Cook, stirring, for two minutes. Gradually add the milk and cook, stirring, until thickened. Stir in 1/4 teaspoon of salt, the black pepper, and 3/4 cup of the cheese. Stir in the eggplant and diced tomatoes. Spoon the eggplant mixture into the prepared baking dish. Top with the remaining 1/4 cup of shredded cheese. Melt the remaining the tablespoons of butter. Combine the breadcrumbs with the chopped or dried basil and melted butter. Toss crumbs to mix then sprinkle over the eggplant mixture. Bake the casserole in the preheated oven for 25 to 30 minutes or until it's bubbling around the edges and the topping is browned. "Easy and tasty! Made this for dinner tonight to use up garden excesses of eggplant and tomatoes (I used cherry tomato). This was easy to prep; used items normally found in the pantry and also used garden items that are in abundance this time of year. My only substitutions were slicing the cherry tomatoes in halves or quarters, depending on size. Also added extra cheese! Delicious! Will make again." L.P.
"I used mozzarella instead of cheddar. I also used canned tomatoes (drained) instead of fresh. The fresh bread crumbs with the melted butter and basil were the perfect topping. Will definitely make again....very meaty, yet no meat.....loved it!" Doug L.